Early this year, Brinca Dada wowed us with their beautiful eco-friendly miniature Emerson House. Now the design company extraordinaire has an amazing new dollhouse up their sleeve. Set to debut in Spring 2011, the Bennett House is so impressive you’ll want to box up your belongings and move in — but, of course in order to do that you’d have to be a mini-you. This breathtaking townhouse-style miniature is influenced by the De Stijl movement of the early 20th century and features lines, squares and rectangles in asymmetrical patterns along with a minimal color scheme. Bennett House is far better than just a lovely and amazing abode; it’s also spacious and eco-friendly. The townhouse, which features both open and close play alternatives, includes a two-story living room, elevator, roof top pool and glass rail balconies in both the master bedroom and children’s bedroom. Solar-powered LED lights make for awesome pretend play by day or night. The entire Bennett House is made of CARB-certified woods and non-toxic, lead-free paints and stains, which allows your child to play and breathe easy. 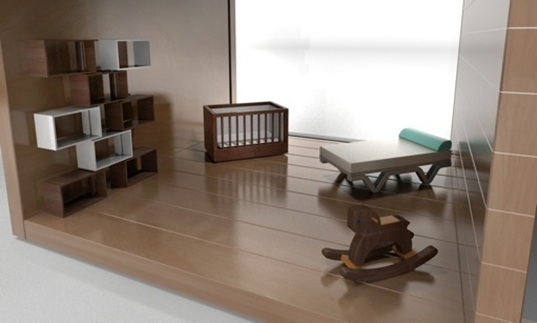 Your child can also outfit her little house in absolute style with the Brinca Dada gorgeous modern furniture sets available for the holiday 2010 season, such as the adorable nursery collection shown above. The only downside: You’ll have to wait until spring for Bennett House — but this is a wait that will be well worth it. TIME TO CHANGE AND MODERNIZE DOLLHOUSES!!!! !LOVE IT!!!!!! !LOVE IT!!!!!!! !LOVE IT!!!!!!! Early this year, Brinca Dada wowed us with their beautiful eco-friendly miniature Emerson House. Now the design company extraordinaire has an amazing new dollhouse up their sleeve. Set to debut in Spring 2011, the Bennett House is so impressive you'll want to box up your belongings and move in -- but, of course in order to do that you'd have to be a mini-you. This breathtaking townhouse-style miniature is influenced by the De Stijl movement of the early 20th century and features lines, squares and rectangles in asymmetrical patterns along with a minimal color scheme.